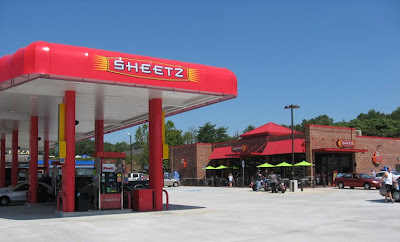 Home » business , commercials , eden , north carolina , rockingham county , sheetz » Rockingham County getz a Sheetz! Rockingham County getz a Sheetz! Sheetz opened its first (and hopefully not last) location in Rockingham County this past week, located in Eden at Van Buren Road and Stadium Drive (it's right next door to King's Inn Pizza for those of y'all familiar with local geography). I paid my first visit to the new place today and was delighted to get another of their scrumptious Italian sandwiches. Up 'til now I've had to go to Greensboro or High Point for the nearest Sheetz. Now there's one just 20 minutes away! And like all the other Sheetz stores it's open 24 hours, 365 days a year. Anyhoo, if you're in the area there's a new place for great food whenever you get the munchies. Check 'em out!